Manchester United’s performances are worthy of a place in the Premier League title fight, according to Jose Mourinho. Mourinho feels United have deserved to win more points. 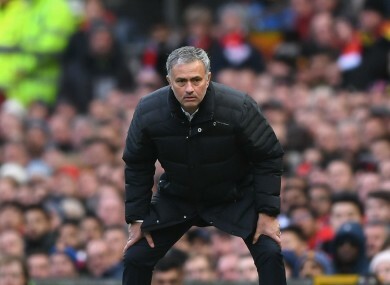 JOSE MOURINHO ADMITS he has had to manage Manchester United against his natural defensive instincts as he struggles to bring a title fight to Old Trafford. Last season, United finished closer to the Premier League winners than any time since Alex Ferguson’s retirement, though they were still 15 points adrift of Leicester City. Table-toppers Chelsea are already 13 points clear of sixth-placed United, who have won only one of their last eight league games. Mourinho’s Chelsea vintage of 2004-05 set Premier League records for points accrued, goals conceded and clean sheets kept as they romped to the title, but Mourinho admits United’s legendary lustre for attacking football has forced a rethink. “I’m very happy with the evolution of the team, I’m very happy with the difference between the team I got handed and the team that is playing now,” Mourinho told Sky Sports. “I find [United's position] unfair, I find that we should have much more points than we have. “You look at the table, it looks like other teams are better than us, when in my opinion this is not true. “So many draws we deserve victories, if you transform these draws to wins we would be very close the top of the league, in-between the top three or the top four. So I find it is more unfair, but there is only one way [to climb the table], keep working. “[I like] the dominance, the quality, the beauty of our football, the objective of our football. “We are not a team that defends and waits for opponents to make mistakes, I know how to build these teams – I did it before, being very pragmatic. Mourinho says teams chasing the title are not a patch on his side, despite United trailing the top four by nine points already. “In terms of quality of our game and organisation of football I think we are above what I expect,” he said. “The evolution was really good. “In terms of results, I’m used to different results, a different profile as a team – the team that scores and doesn’t concede, very efficient in not needing so much possession and control to make opportunities to score. “I’m just a bit disappointed with that because I see teams in the Premier League that are not comparable in terms of quality in their game but they have much more points than us. “We need to score more goals than our opponent, we play better than them, we have the dominance, we need lots of opportunities to score goals, we concede even from naïve situations or situations complete unexpected. Email “Mourinho admits changing style for United”. Feedback on “Mourinho admits changing style for United”.